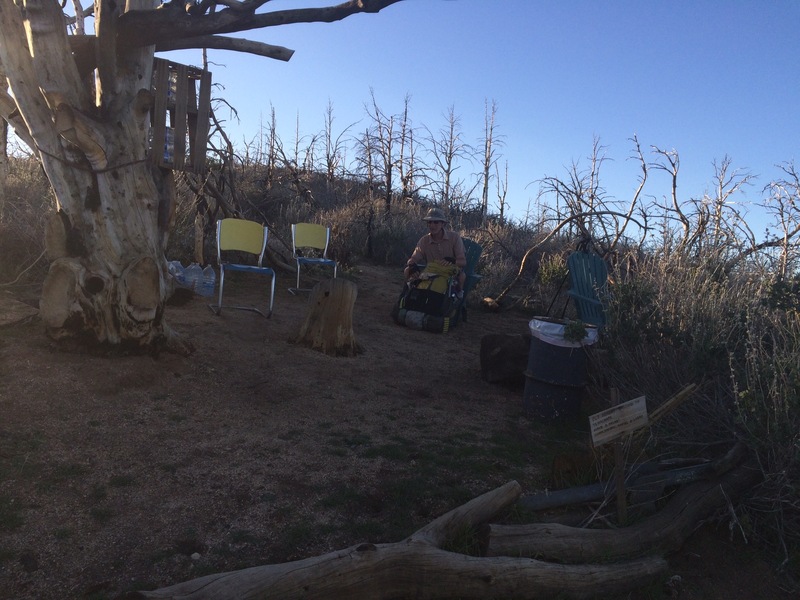 In the Mojave Desert, south towards Hiker Town, March, 2015. 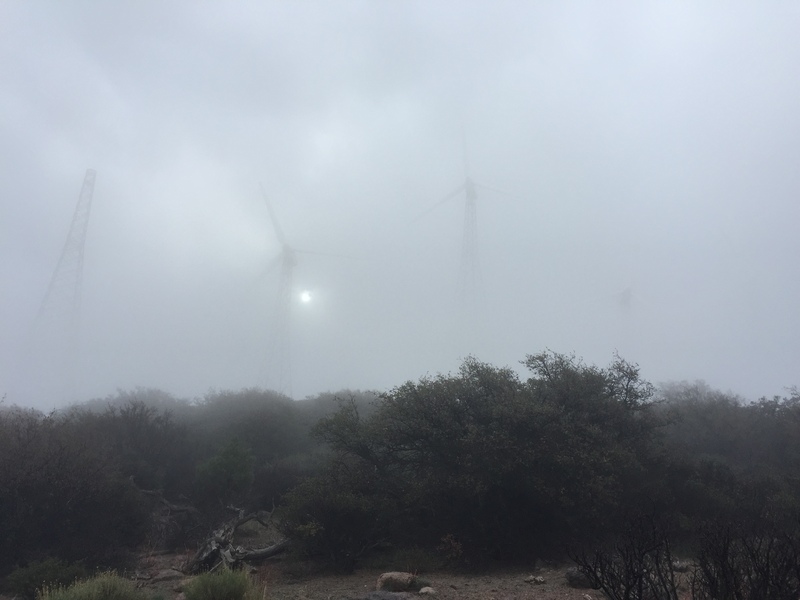 When we first attempted a portion of this segment two years ago, we encountered incredibly strong winds. We would also learn later that part of what caused our trouble in getting through that hike was Patti’s anemia. That caused us to turn around and to give up the hike after just four miles. Returning last week, however, we found a much different set of conditions and we had an amazing time. We had mostly mild winds and favorable weather conditions, making getting through this, our longest segment yet, much easier. But more importantly, Patti’s health is now better. That’s not to say that this was an easy hike. The severe California drought continues to play havoc with hikers this year. Recent reports suggest California now has enough water to sustain its needs for only the coming year. That is a frightening thought to residents, water authorities and hikers alike. The water situation played a huge role in how we planned our hike. An excellent recent article published on the PCTA.org website and written by Jack Haskel, entitled “The Problem with Water Caches on the PCT,” discusses the need for hikers to rely on their own measures to have water on the trail and to not rely on the goodness of trail angels and water caches to get by. As Haskel points out, caches left for hikers often end up being eye sores and sources of litter when the caches are not properly maintained. There is also the problem of hikers taking the supplied water for granted. Patti and I determined we wanted to heed these concerns and would carry or cache our own water for this long trip. We knew that water was virtually non-existent on this segment and we didn’t want to be part of the problem. So, we planned to store water at two locations along our trail route. This was necessary because we couldn’t carry enough water for the entire trip. After leaving one of our cars at Hiker Town, our ending spot, we took our 2nd car and travelled to Highway 58 at Cameron Road. 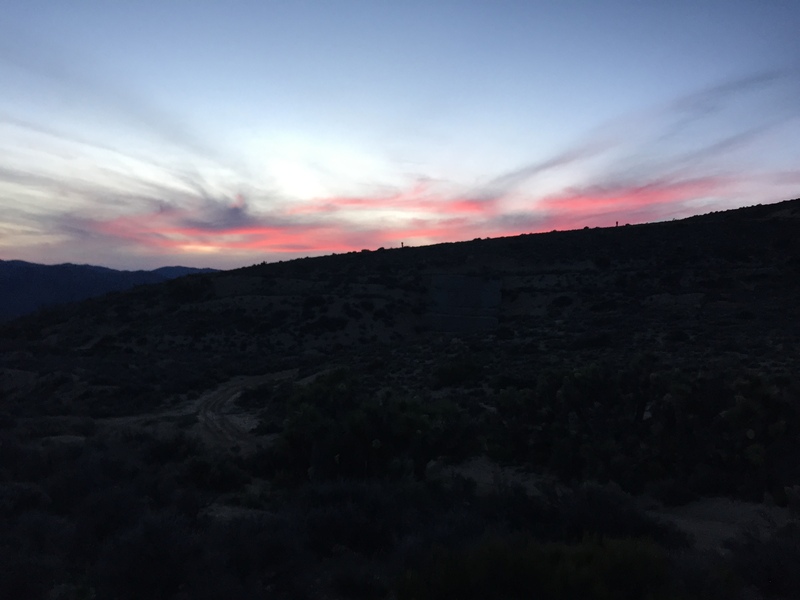 We found the PCT intercepting with the exit there and we buried two gallons of fresh water near a Joshua tree. Then, we continued driving north to Bird Spring Canyon Road approaching from the west. 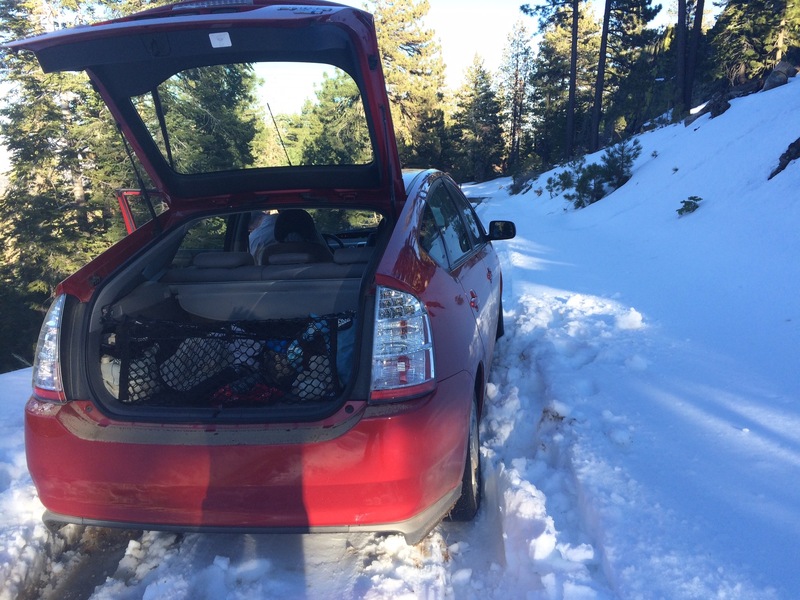 We took Patti’s poor Prius up a steep and rocky Pruite Mountain Road, (oh, and snowy – we got stuck for two hours until we could dig ourselves out) before we turned onto Bird Spring Canyon. We made it about one mile in toward the trail before the road became rocky and not passable. We decided we couldn’t ask the Toyota to do anything more for us and cached water right there, about 1.5-miles off the trail. But more on that later. By the time we got our one car dropped off at Hiker Town, had our two caches in place and finally arrived at Walker Pass, it was already 10pm and some 11 hours after leaving our home. Our hope to get a few miles hiked that day dashed, we settled in and fell asleep in the car hoping for a smoother start early the next day. We left Walker Pass the following morning by 8:00. We initially climbed briefly before settling into a relative flat walk. Much of the day was walking an OHV (Off Highway Vehicle) route, just one of many we would come across. We had lunch off the side of one OHV road and were hidden away enough that many of the off-roaders didn’t even see us. But once we got back onto the route, the off-roaders and we exchanged hellos and waves. But I could tell they didn’t like seeing hikers on their route anymore than we like seeing them on the trail. The following day was my birthday. We got up a little earlier than the day before and were out on the trail by 7:40. Our plans included picking up our first cached water off of Bird Spring Pass. When we dropped the water off two nights earlier, we found a small tree with lots of rocks around it. We found a small crevice made by the rocks and placed our Platypus water bladders into it. Then I put small rocks on top of that, then a few dead bushes I found laying around, and then finally, larger rocks to hold it all in place. We worried that I wouldn’t find it coming down from the other side so Patti placed a double stack of rocks on a larger rock across the road from our stash. We checked Half-Mile and saw that the trail was only 1.2-miles from the stash so, we pretty much knew what we had to do. Or, so we thought. Half-Mile correctly listed the mileage but I didn’t consider that the distance was “as the crow flies” not as the road goes. Given the steep terrain, the road was a series of switchbacks making the distance about double what we thought. Additionally, it was very hot and dry making the climb back up with the water on my back, all the harder. Luckily for me, Patti convinced a nice OHV’r to come check on me. And, while he did give me a ride back, it was only after finding me just about 300 yards from the top. I was grateful nonetheless. The remainder of that day and much of the next was particularly hard for us as we were so weighed down by water. 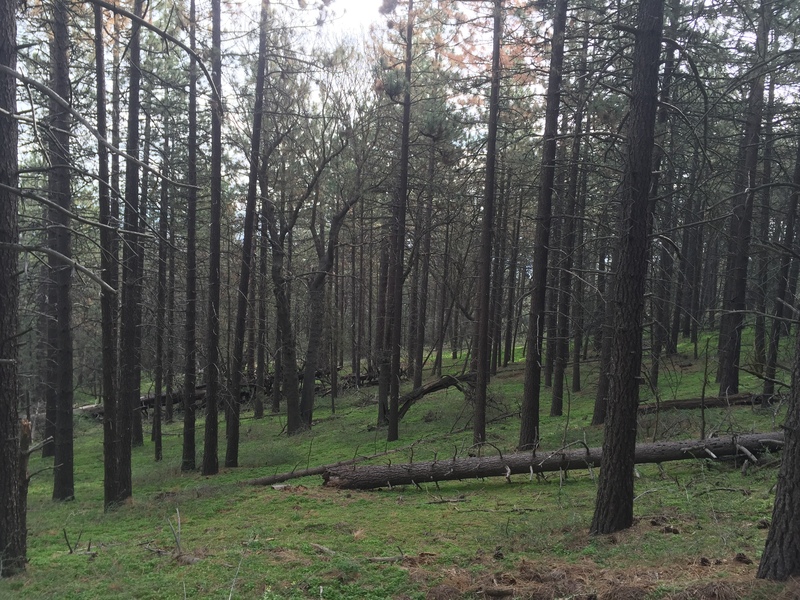 We hiked through contrasting landscapes of forest greens and desert browns until coming upon a burn zone. The scene was eery and stark. We came across an open ended “cave” of rocks. We pitched the tent under the cover and as we faded off to sleep, the wind was strong and the air cool. 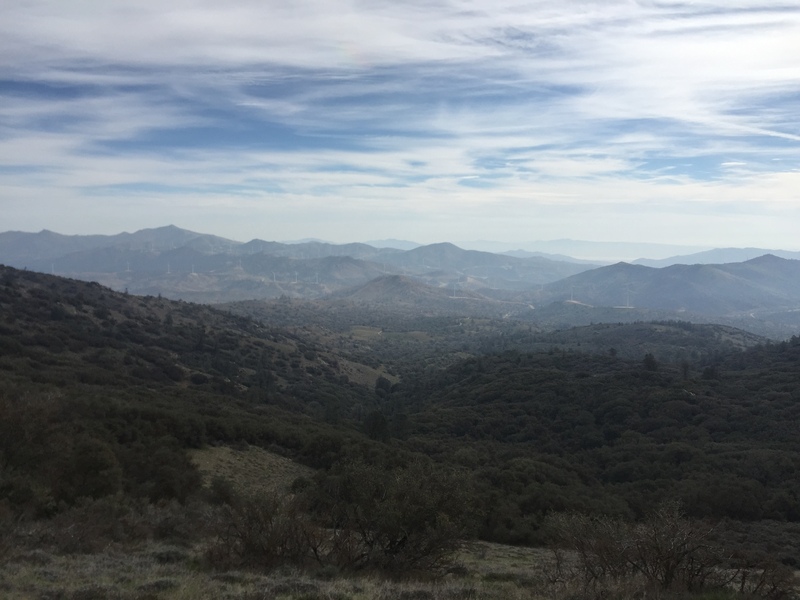 Once we cleared the Highway 58 landmark, we approached the Tehachapi Mountains. This is the area we kind of considered to be our greater challenge, our nemesis, in a way, that defeated us last time. Patti and I both felt determined to overcome this section. It was hot and dry and very clear out, so the sun was beating down. But the wind was mild, so unlike it was last time. We plodded on and found our stride. We looked for (and found) the bush we coward near two years ago, hiding from the winds. We defiantly and smugly powered by. Right about then, however, Patti was bit by something (we think it may have been fire ants), and experienced a lot of pain to her ankle and upper foot area. We stopped to care for that before moving on. Neither one of us wanted to revisit the kind of problems we had last time. Patti and I discussed along the way how somehow, this hike was different. Ordinarily, there is always a certain trepidation when we approach our hikes. We know there is always a “breaking in” period because we don’t hike all the time. We often struggle with how slowly we hike. We often dread climbs. We even have come to call the enjoyment we get from hiking as “secondary fun” because it’s usually easier to see the fun in hiking only after we have come home. But we each separately came to see a certain peace with hiking this trip. I didn’t find myself dreading the hills. Didn’t feel like complaining about my pack weight. It was easy to just be part of it and to accept it for what it was. It felt like a kind of giving into it, a release. It’s significant that Patti and I both had such similar epiphanies on virtually the same day. Our last day of hiking was a 27-mile crossing of the Mojave Desert. This was largely a walk on gravel above the underground California Aqueduct. At one point, a Sheriff pulled up to check on us. He asked if we had seen anyone else. We hadn’t. Patti thought that he was just checking on us. I was pretty sure he just wanted to get a good laugh. Why would anyone want to hike on a hot day through the Mojave Desert? 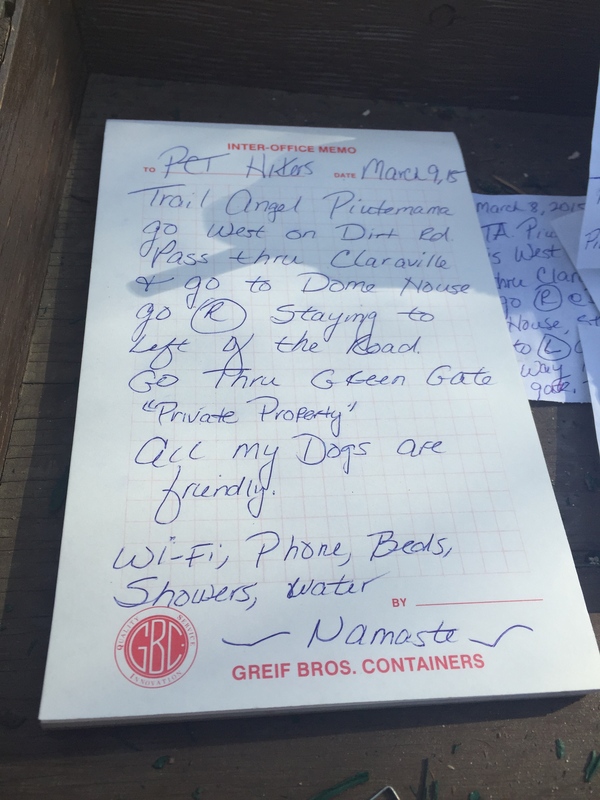 A bit more about water, water caches and trail angels: I mentioned above how Patti and I intended to carry and cache our own water on this trip. This is arguably the driest section of the PCT and as you all know, we are in one of the worse droughts this area has seen in decades. The fact is, despite having the best intentions, we thankfully found and in many cases took advantage of, the water caches so generously provided by trail angels. At Bird Spring Pass, we found a small cache of roughly ten gallons of water. However, we did not need to use this cache because we had cached our own water nearby. But we did take some water at the Tehachapi/Willow Spring cache as well as at Daniel and Larry’s cache near mile 549. These “water sources” were used in addition to the natural sources we found at Landers Camp at roughly mile 609 and the Robin Bird Spring at mile 602. Without these extra sources of water, we would not have had enough. As it was, Patti ended the hike with less than five ounces of water and I had just under ten. We are both very grateful for the generosity of the trail angels who left this water. Just a reminder that our book, Hiking Cancer is still available in e-book format or directly from us. We are also now on Instagram as #McShap.